These salmon burgers are fresh, easy and delicious. 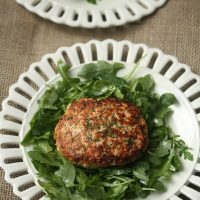 The salmon patties are packed with fresh herbs and served on a bed of arugula to make them more healthy. Either finely mince the salmon by hand or run it through a food processor until coarsely ground. Ideally, you'd pulverize half and chop half by hand so that there are still some chunks of fish, but feel free to do whatever is easiest for you. Combine the salmon in a medium mixing bowl with the dill, lemon juice and zest, mayonnaise, mustard, capers, garlic, and salt. Divide the mixture into 4 balls and shape them into thick patties. Arrange the patties on a plate and chill in the refrigerator for 15 minutes or up to 2 hours. This will help the patties stay together without the help of breadcrumbs. Set a large cast iron or non-stick skillet over medium-high heat. Coat the pan with a thin layer of oil. Cook the burgers for 3 minutes per side, or until nicely browned and firm, being careful when you flip them on the first side that they don't fall apart. Serve the burgers immediately with toasted buns or on a bed of arugula with lemon wedges on the side. You can skip the chilling, but be careful when flipping the burgers as they will fall apart more easily.